Started looking at Google maps, realized I had a bunch of maps I had created that marked places mentioned in books. Further realized a lot of these places were in Europe, so I pulled them all up, one after the other, and this is what I saw. However, what you see here is just a picture, none of the placemarkers in this image are live. Theoretically I could create this map with live placemarkers, but I would have to export all of the various component maps, edit the resulting KMZ files, and then import the combined KMZ file back into Google maps. That is more work than I am willing to do right now. Evening listing all the seperate maps that went into this map is more than I want to do. Mark Twain. I always liked his stories. I found this quote on the bottom of a Carpe Diem newsletter. No wonder I don't like to travel. If we are going to build a new bridge for motor vehicles over the Columbia River, it needs to big enough for current needs and expandable so that it can meet future needs. It needs to be at least twice as wide as the current bridge and it needs to be expandable to 100 lanes of traffic. Too much? I don't think so. Of course just building a bigger bridge isn't going to solve our congestion problems. If we really want so solve our traffic problems, we need to upgrade I-5 from the California border to Seattle. Doubling the number of lanes of traffic would be the immediate need, but I suspect that (if we ever got that built) it would become congested again within six months. If we quadrupled the number of lanes that might buy us a few years, as in maybe five years. Such massive construction would have a big impact wherever you put it. You could spread it out by building several smaller roads, but then you will just have a smaller impact on more places. On the other hand we could do something to reduce the amount of driving people do. One way would be cause a massive recession. Oops, did I really say that? People with less money to spend on gasoline drive less. Or we could raise the fuel tax another dollar a gallon. That would have the same effect. Might also help prolong the recession, a double bonus! Maybe the internet and cell phones will help, and maybe they already are. I buy my books from Amazon now because I don't want to have to fight the traffic and parking to go downtown to Powell's, the only place I know of with a good selection of used books. Raising the gasoline tax is unlikely, more people are more attached to their cars and cheap fuel than NRA members are attached to their guns. Of course, we could cut out the middle man by conquering Saudi Arabia. That might drop the price of fuel far enough that we could raise the gas tax without raising the pump price. Squashing Saudi Arabia ought to be a piece of cake compare to Iraq. Oops, I was thinking nobody lives in Saudi Arabia. Turns out there are almost as many people there as there are in Iraq (almost 29 million each). Just imagine a one hundred lane bridge. If it was all one level it would be a quarter mile wide! You could make it multi-level, 10 levels of 10 lanes each. That would make it only 120 feet wide but 120 feet tall. Probably taller. What would you do with ten levels? For starters, you could put trucks on the bottom level. That would reduce the strength requirements for the upper levels. Half a dozen cars does not weigh half as much as a full loaded semi-truck. That would also reduce the overhead clearance requirements for the upper levels. So you have one level for trucks, one level for Northbound traffic, another for Southbound traffic. Add an upper level for pedestrians. Imagine putting a restaurant up at the top! Imagine if they had put a restaurant on top of the Fremont bridge. That would draw the crowds. With that many people, you would need parking, so we could devote one level to parking. Make a park out of the top level. It might be a pretty nice place. There was one little issue that I heard about that involved Pearson Airpark. Because it was so close to the bridge, it placed a height restriction on the bridge. Well, Pearson is going to have to go. On the other hand, maybe we could relocate it to the top level of our new supercalifragilistic bridge. 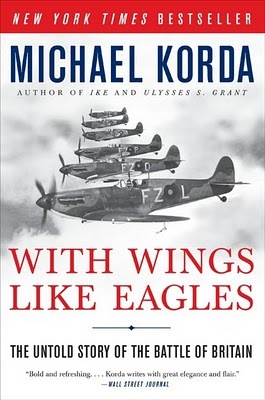 I just finished With Wings Like Eagles by Michael Korda. That didn't take long. A good, interesting book about the Battle of Britain, which was in the summer of 1940, a good year and a half before the US got into the war. The main thrust of the book is that Hugh Dowding, the head of Fighter Command, and hence all fighter operations during the Battle, was a prophet who saw what form the air battle was going to take and correctly prepared for it. It was also fortunate for Britain that the two Prime Ministers before Churchill (Baldwin & Chamberlain) helped build up the fighter forces long before the war broke out. I am reading along here and the author mentions that he got out of RAF in 1953. Wait a minute! 1953? I was two years old in 1953! How old is this guy? Old. Born in 1933, that would make him 77, and he can still turn out a best-selling book. Huh. I am a little disappointed in the quality of the paper used in this book. The book is a little bigger than your standard paperback, about 5 & 1/2" by 8. Used to be larger paperbacks like this used a better grade of paper, but this looks and feels a whole lot like newsprint. An Alan Furst novel I bought recently suffers from the same affliction. Is this just the effect of general penny pinching by the publishers, or an effect of the Bush administration spending a trillion dollars on the war on terror? Steak is now nearly $10 a pound, but the consumer price index is only up 3 & 1/2% since 2001. How can that be? Oh, didn't you know? Steak isn't included in the CPI calculations any more. You can eat chicken instead. Aren't you glad you don't need to eat steak any more? I know I am. NOT. I went to the dentist this morning. My appointment was for 9:30. When I got there, there were no parking spaces in the lot. First time that has ever happened. There were no parking spaces on the street in front of the building either. I ended up driving around the block and parking on the far side. It was raining. I ended up being about five minutes late. OK, it wasn't really raining, it was more of a drizzle, and I did remember my hat. I was there for step one of getting a cap put on a tooth. I reminded them I didn't want any adrenaline with my Novocaine. Last time I had work done I got a 12 hour migraine, and I didn't want a repeat performance. The first thing they did was give me some yucky tasting stuff to swish around in my mouth. Turns out it was Listerine. Yuck. They gave me two shots and they were the worst part of the entire ordeal. They tried giving me a bite block to hold my jaw open, but it didn't work out. It was easier just to open my mouth when Dr. Parent needed in. She would go in and work for a minute, and then she would be out. Time to change bits, get some goop, or something, and that gave me time to let my jaw relax. Much better than having the bite block in continuously. They put some kind of clamp and a rubber sheet in my mouth. I do not know what the clamp was for. I surmised the rubber sheet was to collect debris and to keep the work site dry. I now realize they are going to work on the tooth in my lower jaw, the one that has had a crack in it for like forever. But this is probably not the one that one that is giving me problems with cold things! Oh, well. Better to get it done now before it breaks some more and causes some real trouble. They wanted to know whether I wanted a porcelain crown or a gold one. I was surprised that they were asking me this at this late date. I would have expected them to get this cleared up long in advance. On the other hand, I'm an adult, I should have some idea of what I'm in for, I should have considered this beforehand. But wait! I've got an excuse! I was worried about the after effects of the adrenaline. Actually it was a simple matter. I already have one crown, a porcelain one, and it has a chip out of it. Gold is tougher, it has fewer problems, so gold it is. Dr. had to go below the gum line for at least part of the tooth. This required the additional work of pushing a string inbetween the gum and the tooth so the Dr. could get at the tooth without damaging the gum. Actually, I think is was a series of three strings, each slightly larger in diameter than the last. I got home about 11:30, had a cup of hot (warm) chocolate and took a nice long nap. When I woke up the numbness was gone and no migraine. I didn't get around to taking the picture till they were almost all done, which is why you can't see anything interesting. Except the cool reflection of the lights in the sunglasses. The bright one in the center is the dentist's work light. The two greenish ones to either side are the flourescent room lights. I went to the dentist this morning. I have to cool my heels in the waiting room for a few minutes, but they have a couple of new car magazines, so I am entertained. Car & Driver has a story about five American made cars that the auto industry can be proud of. First one was a Cadillac Coupe. In general I approve of Cadillac. If I ever need another car I might buy one, but it will be a used one. They want too much money for the new ones. And I suspect there are plenty of late model ones available. Something about Cadillac seems to attract the flash in the pan crowd. Then again, if I were ever in the market for such a car, it might not be a Cadillac. I don't like the look of the recent models, all "edgy" and all. I want a car that looks like a car, not like someones' Hot Wheels fantasy. Another car they liked was the Buick Regal, which is going to be available with, get this, a manual transmission! When was the last time any Buick had a manual transmission? I just can't imagine such a thing. Turns out the Buick Regal is a rebadged Opel, or an Opel is a rebadged Buick, your choice, and they build the Opel with a manual transmission. 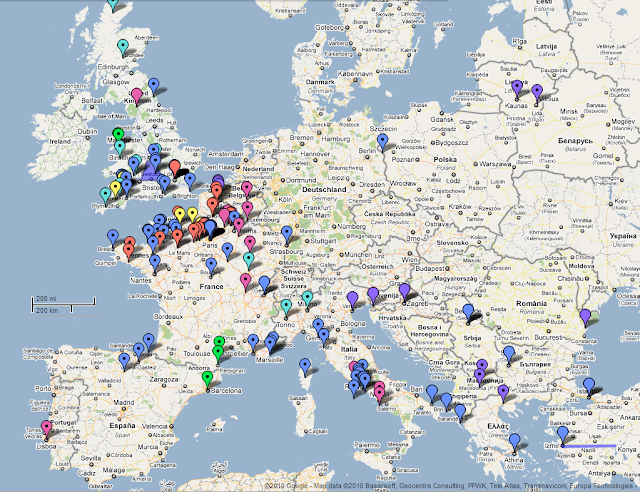 So for the first year or so, they will be importing Buick Regals from the Opel factory in Europe. Weird. A third vehicle was the new compact M-RAP vehicle from Oshkosh, weighing in at a svelte 12 tons. Oshkosh has a billion dollar contract to produce these things. Car & Driver was impressed with it's off road capabilities. They had it out on a course on the 73,000 acres of the Aberdeen Proving Grounds in Maryland. That's another one of those weird East Coast things, like New Jersey being called the Garden State. In my mind the East Coast is so crowded there isn't room to turn around, but you get 50 miles out of town and you can be lost in the woods, just like here. They also had a story about a new little, diesel Volkswagen that gets really good mileage. The weird thing is that the engine seldom gets warm enough to generate enough heat to heat the passenger compartment. Car & Driver is based in Michigan, and Michigan is cold in the winter. Canadian versions of this car have an auxiliary electric heater. This is just too weird. I wonder if running the electric heater has a significant impact on mileage? The last thing I read was their story about the Toyota gas pedal fiasco. They tried stopping some cars while holding the gas pedal to the floor. No problem, car stopped, often in not much more distance than normal. You get up to crazy high speeds (greater than 100 MPH) and okay, it does take a little more distance. You get up to crazy high horsepower (500+) and crazy high speeds and they weren 't actually able to stop the car, but they did get it down to 10 MPH. At that point you can turn off the ignition and stop the car without power assist on the brakes. You may remember that Audi had a similar problem a few years ago (people complaining about unintended acceleration). Audi were front wheel drive cars with in-line engines mounted in-line with the car. (Most front wheel drive cars have the engines mounted crosswise, the crankshaft is parallel to the front axle.) The transmission protrudes into the passenger compartment, much like it does on a conventional rear wheel drive car. But it's European, and compact, so the drivers foot wheel is cramped, and the accelerator pedal is to the LEFT of the center line of the steering wheel. You sit facing forward, but your legs are canted a few degrees off to the left. (And this is for a car with left hand drive, like America and most of the rest of the world.) Supposedly it was not enough to be a problem, except that, well, evidently it WAS. They never found anything wrong with the Audi's. If there was nothing wrong with the car, the only thing left is the driver. I really don't like the shift-to-neutral advice being given out. In my experience, an engine given full throttle with no load (shifting to neutral removes the load) will indeed experience unintended acceleration leading to the engine breaking some expensive internal pieces. Engines are expensive. Of course, these days, engines probably all have computerized controllers that will keep them from over-speeding and cratering. And for that matter, I have not actually seen an engine destroyed by running at full throttle with no load. Never in a position that I could afford that kind of damage. I have had a couple of engines throw a rod, which pretty much destroyed them. One was an old $150 Cadillac, and, well, you get what you pay for. It was a heck of a car while it lasted. The other was a Ford LTD that went from fine to finished in about 5 seconds while I was accelerating up an on-ramp. I suspect a bolt on the big end of a connecting rod bearing must have broken. I can think of nothing else that would cause it to go from to fine, to tap, Tap, TAP, BANG in that short an order. This book has been on my mind this last week, or actually, a few of the ideas I remember from the book, along with the title. Heck of a good title. I just went a-Googling for it and found one (1) copy for sale and numerous reviews, which mostly panned the book for being poorly written but praised for the plethora of big ideas. The Weapon Shops Of Isher and The Weapon Makers by A. E. Van Vogt, were published in the early 1950's. I probably read them when I was a teenager in the 1960's. 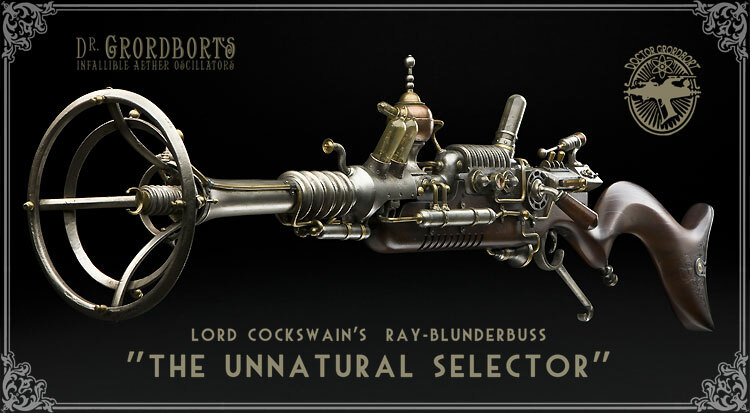 The atomic engineer Neelan, one of three main viewpoint characters in The Weapon Makers , suffers to the full what I call the van Vogtian curse of surprise. Not only is Neelan often startled by events, and struck dumb by realizations — sometimes twice on the same page — but he is even surprised, confused, or dumbfounded by things he already knows. "The right to buy weapons is the right to be free". The weapon shops are a court of last resort for people suffering from the injustices of the Empire of Isher. They form the opposition. Reminds me of a phrase used in England: the loyal opposition. I am wondering if this an idea whose time has come, or maybe it's already here. Went to Costco this afternoon to pick up a couple of things. Stopped by the book aisle. They must have had a couple of hundred different novels for sale. I noticed about eight books about WWII, I didn't see any books about any other wars, though that doesn't necessarily mean anything. I thought it was a little weird to have so many books about WWII. On the other hand I bought two of them: With Wings Like Eagles by Michael Korda and Aces High by Bill Yenne. They are both about fighter aircraft. The first one is about the Battle of Britain and the second one has P-38's on the cover. I have not heard much about the P-38. We shall see if I learn anything. There is a line by Winston Churchill quoted in the front of the first book: "Never in the field of human conflict was so much owed by so many to so few." It came to me today that it wasn't just the few men who flew the planes that won the battle. They were certainly crucial, but there was a whole nation behind them. People who built the planes, people who built the tools used to build the planes, people who fed all the others. There was a vast organization behind these few who were at the tip of the spear. They made the spear sharp and more effective, but you still needed the shaft behind the spear to give it that killing thrust. My wife and I watched The Hurt Locker off of Verizon tonight. $5. Not a bad price for not having to plan ahead, and not having to get up and go out to get a movie. The title of this post is from a bit of text on the screen at the beginning of the movie, and you know, if you think about it, it certainly explains a whole lot about the human race. Grim little story about guys going out every day to do a really nasty job in a really nasty neighborhood. Come back to the base every night where things are a little more sane, but not much. I wonder if that really helps. Or would it be better to just be immersed in an insane environment all the time? Reminds me of something I read a while back about soldiers in Iraq: when they are in Iraq, the only thing they want is to go home. But once they get home, the only thing they want to do is to go back. Yeah, sounds kind of like a drug to me. The Dalai Lama is really Chuck Norris in disguise? Or is it that Chuck Norris is really the Dalai Lama in disguise? Or maybe not in disguise? I dunno. You tell me. The Dalai Lama leaves the White House via the back door. Update February 2017. The link has died. 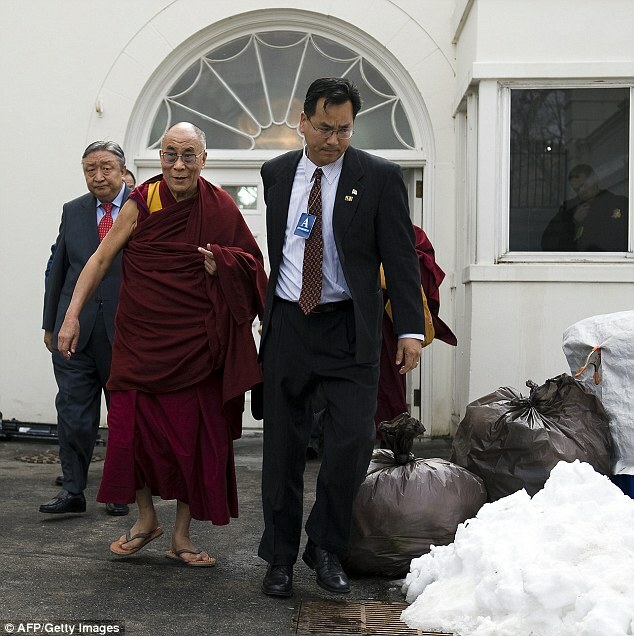 The whole thing seems to be that the Dalai Lama was photographed leaving the White House during the winter. There is snow on the ground and he is not wearing a jacket, in fact his right arm is bare, as usual. This led to speculation that he must be as tough as Chuck Norris. Marc was in Santa Clara earlier this month using a laser interferometer to measure how much an inductor jumped when a surge of current went through it. The inductor, probably just a U shaped piece of wire, is part of high power graphics card for a PC. When the card is running at full bore there can be 100 amps of current running through the inductor. If the amount of current is constantly changing, the inductor will be constantly flexing, in fact vibrating. When playing some games that use complex graphics, the inductor will vibrate enough to make noise, in some cases loud enough to be annoying. During one test the inductor was so loud he had to wear sound absorbing headphones to protect his hearing. Here's a video that doesn't do a half bad job of explaining what an interferometer is and how it works. I looked at a dozen or so others. They were all much worse. They were either in German, had loud bass thumping music, or didn't show much of anything. You can get power supplies for PC's that will deliver 1800 watts. With no losses, that is going to require 15 amps from your 120 VAC wall outlet. The graphics card uses the 12 volts from the PC's power supply and converts it to one volt for use on the board. 100 amps at one volt is 100 watts, which is as much power as it takes to run an ordinary household incandescent electric light bulb. OK, I didn't find any 1800 watt power supplies but here's at 1300 watt unit you can buy from Newegg. They also have a 1500 watt unit, but the picture isn't as cool. The power supply on the graphics card is a switching power supply and it is pretty amazing. At idle the card burns 25 watts. 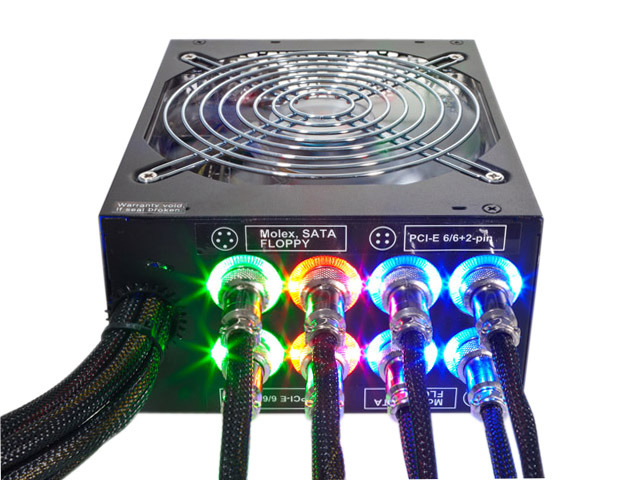 When someone sits down to play a game, the demand for current can go from 25 watts to 100 watts in one clock cycle, and the switching power supply handles it. The graphics card board itself will flex with changes in current. At times it can look like the ocean with waves moving. Couldn't find a video of that, but I did find this one, so it will just have to do. Update December 2014: Stu just put up a post about a Lego interferometer, and I remembered this one. When I checked I found the picture of the power supply had vanished (wretched Blogger) and the video I had embedded no longer played. I had used a Romanian (?!?) site for this tune, but it quit working. The video is still there, but the user is gone. The link gets translated to this one, here just in case we ever want to return to Romania. After almost a week of fussing, I finally got to the point where I could control the LED's on this project. You might think I exaggerate the difficulties, but I assure you I do not. You see, these little lights are not controlled directly by lines to the CPU, but by another chip, an intermediary. This intermediary is not what you would call civilized, growing up as it did amongst hard nosed gates and latches. It is a child of the hardware world and never learned any of the protocols of civilized discourse. The only language it speaks is that of clock and data. In short, it uses the I2C interface, an uncouth manner of communication somewhat analogous trying to talk to the king of a Byzantine empire using Morse code. I2C stands for Inter Integrated Circuit. It is a serial communications protocol used for transferring data between chips on the same circuit board. It was invented by Philips, which gives me one more reason to hate Philips. I had numerous examples to study, and one piece of code written specifically for this board. After numerous trials I got this last program to turn on all the LED's for one brief moment. I never got it to work again. If it hadn't been for that one shining (!) moment I would have been ready to toss in the towel. I waded through the instructions, and tried to write some code that followed the directions, but there are layers and layers. The worst part is I do not know exactly what I did at the end that finally made it work. So far it seems repeatable, but I am keeping my fingers crossed. One thing that struck me is the use of mnemonics for some things and numbers for others. Writing code for this project involves addressing registers. The processor has 100's of registers, each of which has a name, like I2C2CON which stands for I2C (2nd Module) control register. Each of the bits in this register likewise has a name. The manufacturer has conveniently provided a file which has all the names of the registers defined, as well as providing mnemonics for all the bits in all the registers as well. For some reason, the register names do not seem too bad, but the names for the bits within the registers are too clumsy to use easily. Things like I2C2STAT_BCL_MASK are just more trouble than they are worth. It is much easier to just say BIT10, also slightly more reliable. For this project I had to deal with each register often enough that I learned it's name. I never bothered to learn it's address. I might not deal with all of the bits in that register, and I might only deal with any particular bit only once. To use the bit, I read the reference manual that describes the function of the register. It's position within the register, along with the register's name is documented in the manual. However the mnemonic assigned to the bit is in another manual, or in a header file. So using the mnemonic requires an additional step to find out what it is. Well, that explains why I didn't use the mnemonics for the bits within the register, but I did use the names of the registers themselves. Huh. A: If your car could travel at the speed of light, would your headlights work? A: Yes, er, no, er, wait a minute! This is a trick question. I don't like trick questions. I think you must be one of them dad-burn pinko-commie-hippie-trouble makers. Get offa my lawn! Actually, yes they would. There is no absolute velocity. There is only relative velocity. The light given off by things coming at you is blue shifted, light from things going away is red shifted. When light is blue shifted the apparent wave length goes down and the frequency goes up. Just the opposite happens when it is red shifted: the wave length gets longer and the frequency gets lower. On earth, shoot, even in the solar system, relative velocities are too small to make a noticeable difference. But you get going really fast and it does start to become noticeable. When they talk about the red-shift of light from stars they are talking about measuring how fast the stars are going away. If they were going really fast, the light would get shifted down into the infrared or even the microwave region. Things approaching each other will see the light of the other blue-shifted. If they were going fast enough the light would shift into the ultra-violet range, then X-rays and finally gamma rays. So if you were driving down the road at the speed of light, everything in front of you would be being blasted by really powerful gamma rays. Any light reflected back at you would be the same. Put on your super gamma ray goggles. Any light from your taillights would be so red shifted as to be undetectable. My wife and I went to see The Receptionist this afternoon. It was a play put on in the old Armory building. I didn't really know what to expect. I had heard nothing about it. For about the first half of the play I'm thinking it is just a light hearted comedy about the wide variety of problems a receptionist has to deal with. And then it takes a left turn into the vicious world of torture. At first I am not even sure that is what they are talking about, maybe the playwright is just playing with words and it's going to come out that they are talking about something totally innocuous. I mean they are talking about it right out in the open in the office as if it just some ordinary daily occurrence. Turns out they are talking about torture and they are talking about it like it is a daily occurrence because it is, that is their office's stock in trade. A grim little tale. There were a couple of good lines. Things really turn the corner when the head of the office is himself taken to the "Central Office" for interrogation. At this point the professional woman asks "who can you trust when you do not know who to trust? ", or something along those lines. A bit later the receptionist says "If they took him in for interrogation, he must have done something wrong." It is not too much later before she herself is taken in for interrogation. After all, she must know something. She's been working in this office for two years. How could she not know anything? They will find out. I'm looking through the program afterwards and there is virtually nothing in there that talks about the play itself. There was one page that talked about office politics. I was aghast at the kind of petty, pointless drivel that was being promoted as advice. I dunno, maybe that's what most people are really like: petty and pointless. "I think you misjudge yourself; people often do. The most distressing bores are most sure they fascinate; the least perceptive will tell you at great length how they understand your feelings; every hero I ever knew was at least half-convinced of his or her own cowardice. If you are not a magnet, so many people could not be so angry with you." From page 341 of Rules Of Engagement by Elizabeth Moon. Update January 2017 replaced missing image. Original came from Weta Workshops. Yo ho ho? Hommes is men, mort is dead, bouteille sounds like bottle, rhum sounds like rum. Um, could this be 15 men on a Dead Man's Chest? Yes, it could and it is. I haven't heard this in like forever, so I went a Googling. I found several recordings on YouTube, but none that I thought really captured the flavor of the song, so you will just have to sing it yourself. And for that we have the lyrics (from Midi Melodies). It was never a real authentic sea chanty. It started as just a couple of lines in Treasure Island, but then it took on a life of it's own. I just finished rereading Stranger In A Strange Land by Robert A. Heinlein. I first read it a long time ago, probably when I was a teenager. It was an interesting book. This is the new uncut version. I thought some of the passages were a little overlong. On the plus side, every few pages there was either a word I hadn't run across before, a bit of history I didn't know, or a line or two I thought worth quoting. I ended up with a page of page numbers. Someday I'll go through them and write up all that info. After mulling it over for a while, I decided that one of the main points of the book is discipline. With three kids in college I also have been wondering about the value of a college education. Someone said that college thought you to think. I am thinking now that the point of college is discipline. Matter of fact, I suspect the whole point of all education is to teach people self-discipline. The accumulation of knowledge is just a side effect. In order to acquire knowledge in things that have no apparent relevance to your life, you need a certain amount of self-discipline to force yourself to learn these things. For some people, learning things is easy. They will not learn much about self-discipline. Others manage to learn the material by dint of hard work. They learn the material, and they get some experience with self-discipline. Others can't be bothered and learn neither the material nor any discipline. I suspect that discipline is at the foundation of the British Empire. Seems I read that the old (1700's) British technique of having a double line of men facing the enemy was something that took extensive training to be able to deliver in time of actual combat. Enemy armies of the 3rd world were more often than not referred to as an "undisciplined rabble". At one time I was working on a theory as to why some people are rich are some people aren't. I came to the conclusion that the rich were better able to control their emotions. I no longer believe that that is the sole essential difference, but it is a contributing factor. Wasn't the whole point of the training of Shaolin monks in Kung Fu to teach self-discipline? Last week one of my friends at Thursday lunch made the point that the economic success of any area corresponded directly with the education level achieved by women in that area. Anyway, I just want to reiterate my idea that the only kind of foreign aid the West should be offering is education. And it should be a long term commitment of 50 years or more. I gave Ross a ride to the Max station at 185th the other day. I saw this sign on the way in while I was looking for the entrance and I was dumbfounded. It took me a while to notice the "Bus Only" sign. I was sitting facing the sun, the sign was in the shadow of a building and maybe 100 feet away which is why it's kind of a crummy picture. I may have to go back and take another one. This kind of signese really deserves some kind of recognition. Curses or laughter, I'm not sure which. Update January 2017 replaced missing image. Word verification has gotten to be a common place requirement for commenting on blogs or posting on forums. That's where you are shown a distorted picture of a word and you have to type it in to show that you are a real live person and not some stupid computer program, i.e. a "bot", a minion of some evil advertising campaign (Buy Viagra now, cheap! You buy now!). Yesterday I ran into a forum that used two forms of this torture. One was Recaptcha, which is a fairly common one, and a second one which only required entering the certain letter of a specified word. I thought Recaptcha was fairly impenetrable, at least for stupid little bots, so this second level of defense seemed superfluous. So I wrote to the webmaster and complained, and he assured me that they needed both devices in order to keep the spammers at bay. Huh. I have to admit I've wondered how difficult if would be to write a program to defeat these word verification defenses. I imagine that image processing software has made tremendous strides in the last 30 years, so I suppose it's possible that some anti-social whiz kid has fallen into the clutches of an evil spam lord and delivered him a program that can pick the text out of those distorted images. Or maybe they've found a weak spot in the word verification procedures that allow them to bypass it completely. We may be moving to network wide identification handles (OpenID, etc.) sooner than some of us expected. My Toyota sends text messages to it's little Toyota friends while we're out driving around because there's nothing good on TV. Twitters too. I wish it would pay more attention. Someday it's going to cause an accident. I am just about done with the books in the Serrano Legacy series, so I'm looking at another series by the same author. Under the description of one of the books I find the word sobeit, and I'm thinking somebody dropped some spaces. So I go to my old reliable dictionary site, Merriam-Webster, and it's gone subscription-only! Bah, so I Google sobeit and I find a several other dictionary sites that list it as a legitimate word, though their definitions leave a little to be desired. One claims it is simply a run together version of the three component words: so+be+it. Another claims it is rare case of the English subjunctive, whatever that is. A third claims it is archaic and the meaning is not quite what you would think. All of which leaves me a little confused. Of course it is still basically the middle of the night, so I'm not quite 100%. I think I'll take the easy way out and just avoid using sobeit. Just heard on the radio, 27% of young men are ineligibly obese for military service (a measure of fitness) up from 6% in 1970. And God knows we're going to need fit troopers to grow Imperial America! Took the family to see Mel Gibson in Edge of Darkness yesterday evening. Ross wanted to see Mel Gibson getting in people's faces, and he did that. There were any number of holes in the plot, but over all it was very satisfying. The bad guys were appropriately smarmy, and they got theirs. The clean up man almost stole the show, especially when he wraps the whole thing up. That's not giving away anything, is it? It was a remake of an old BBC movie that starred Joe Don Baker. There was an excellent scene in the original where Joe has brought a couple of bars of plutonium in a briefcase to a conference on nuclear something-er-other. In the briefcase the bars are packed in foam that keeps them about a foot apart. At the meeting he takes the briefcase up to the dias, opens it, takes out the two bars of plutonium and brings them together in his hands. The bars get excited and start shooting out light and presumably lethal radiation. Joe doesn't care, he's already received a fatal dose, and these people at the conference, well, they are responsible for the whole mess he's been trying to sort out. Needless to say, the people in the conference hall get very excited and start heading for the doors. I did a little reading about plutonium. Seems there are several isotopes. Some are fairly inert and can be handled safely with nothing more than a pair of gloves. Others are highly radioactive and just being in the same room can be very unhealthy. Funny thing is, the safe-to-handle stuff is what gets used in bombs and reactors, while the dangerous forms are not good for much of anything. Just the opposite of what you might think. To get radioactive material to do anything useful, you need to have a large enough concentration that the radiation it gives off finds enough targets to start a chain reaction. The amount of the material controls how fast the reaction procedes. Smaller amounts in nuclear reactors give you useful heat, larger amounts give you runaway reactions: i.e. a bomb. Question I have is would Joe Don Baker's stunt have produced any visual effects? Or would everyone in the room have just fallen over dead? And then there is radiation poisoning. There is radiation wherever you go, you are constantly exposed to it. Normally it is at a very low level and it doesn't appear to have any detrimental effect on a person. Man made radioactive material can be much more dangerous. We can generate enough radiation to kill a person in short order. The amount of radiation you receive determines how sick you will get. If you get some radioactive material in your body, that's a different issue. Most radioactive materials are heavy metals, and heavy metals are poisonous all by themselves. Just look at mercury and lead. Don't look at gold or silver. They're special. If you happen to swallow some radioactive material, that's not too bad. What's bad is what happens afterward. If it just passes through you, not too much harm done, but if it gets absorbed by your body, then it's in there permanently, and it will continue to give off damaging radiation. That way even a small amount can become fatal. My wife told me about an elementary school kid getting suspended for bringing a two inch long G.I. Joe gun to school. Then we have a case here at PSU in Portland where a tenured economics professor has been suspended for accusing one of his students of being a spy for the FBI. As usual, it's a little hard to tell from the story in the paper just what's going on, but it kind of smells like politically correct anti-gun pacifist meets imprudent gun evangelist. What these stories all have in common is small people getting fed up with the way things are going, no one is listening to them, so by God they are going to do something about it. I hear about all the crap going on in the world all the time. The corruption, the stupidity, the arrogance of those in power and I think: geez , what is wrong with people? Well, the simple answer is that they're corrupt, stupid and arrogant. Not to mention greedy. In other words, they are people. And it doesn't have to be everyone. One bad apple can upset the whole applecart, to mix my metaphors. Who shall I blame? Do you blame the guilty parties for being scumbags? Or do you blame the "good guys" for not putting a stop to it? It's just the way it is. I like to think that in general (taking the whole world in consideration), things are getting better. America seems to be suffering right now, but I'm pretty sure we can still put a chicken in every pot on Sunday. But consider this: it costs a million dollars to keep a US soldier in the field for a year. One hundred thousand soldiers will cost one hundred billion dollars. Do this for ten years and you've spent a trillion dollars. Now most of that money ends up as wages paid to people who provide the goods and services used to support the troops in the field, so that money goes back into the economy. But those goods and services? They are gone, consumed, ate up. Is Iraq ever going to be a stable, contributing member of the world community? Who knows, but by the way we conduct our foreign policy, I doubt it. I read a story in The New Yorker last week about Haiti that ended with saying it was going to take billions of dollars of nation building to get Haiti to the point where they could take care of themselves. That is absolutely the wrong approach. The West has poured billions in Africa, and Africa is a bigger mess than ever. I suppose there is some improvement, but for every country that manages to make some headway towards being civilized, another one seems to slip back into anarchy. The only kind of foreign aid we should be giving to other countries is education, and we shouldn't expect any results for 50 or 100 years. "And that," put in the Director sententiously, "that is the secret of happiness and virtue - liking what you've got to do. All conditioning aims at that: making people like their inescapable social destiny." Aldous Huxley - A Brave New World p. 16. Via Marc. "There is nothing quite so complicated as simplicity." Charles Poore (1902-1971), book reviewer for Harper's Magazine and The New York Times. Shock of shocks: he doesn't have his own page in Wikipedia. From Fran. We had a downpour this afternoon. This park is just one acre. It is a little triangle shaped block at the corner of Watson and 7th. It used to be just a patch of grass, but recently it was made over with the addition of a bunch of old weapons and plaques. I happened to drive by the other day and I stopped to take some photos.